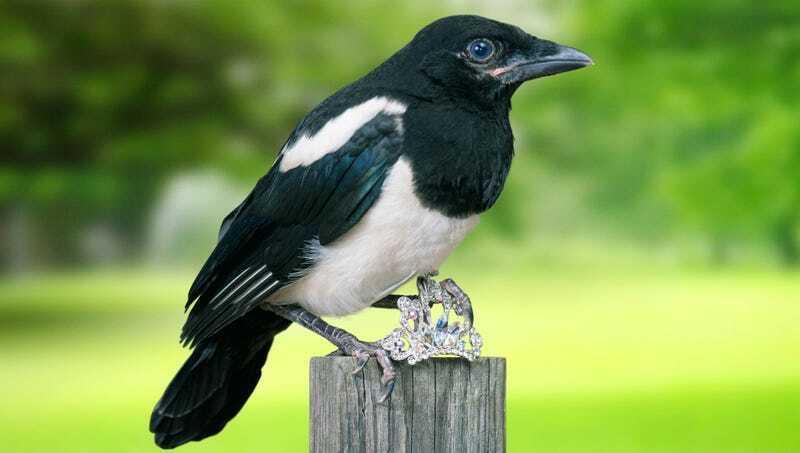 SAN JOSE, CA—Unable to completely dismiss his doubt over his partner’s motives, a male North American black-billed magpie admitted Monday his concerns that his mate was only interested in him for the vast collection of shiny objects lining his nest. “I invited her over to the tree to chill, but she spent more time fondling my disco ball keychain than talking to me,” said the bird, who reluctantly answered his beloved’s increasingly detailed questions about how he amassed so many foil gum wrappers. “I’m more than just a single misplaced pendant earring—I have a lot to offer someone. I really want to be with her, but do I have to keep collecting more and more shiny things to keep her satisfied?” At press time, the magpie, who, like all corvids, is intelligent enough to perform rudimentary counting, was “fairly sure” his stash of glittery hair ties had been dwindling recently.